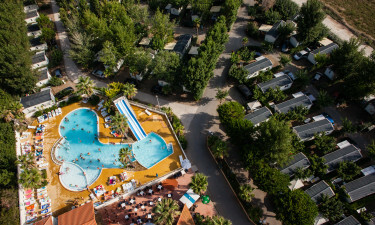 Besides embracing wonderful views of the nearby sea alongside a pristine natural environment, the luxury camping site of Les Sablines is an ideal option for families that have been seeking fun for children and adults alike. LUX-camp is happy to provide further details in regards to this incredible camping holiday. Why Should I Choose Les Sablines for a Luxury Camping Experience? Quality mobile homes provided on each pitch. The maritime nature of this holiday camping site has enabled it to be popular with visitors from all over the world. As the Mediterranean Sea can be reached simply by walking through the property, it has never been easier to enjoy a day trip with the family or a cooling dip in the waters when the temperatures rise. Also, Les Sablines is a central location that is perfect for exploring the Languedoc region of France. Camping luxury does not necessarily have to equate to lounging underneath the tropical sun alone. There are countless visitors who hope to enjoy a more active holiday during their stay. So, patrons will be pleased to learn that this luxury camping site offers options such as children's entertainment and table tennis. Should the sea prove to be too cold, it is always possible to swim in a large open-air pool found within the middle of this complex. 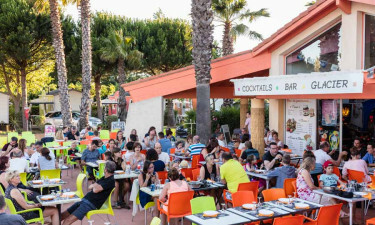 Sailing, surfing and golf are found within a handful of kilometres from Les Sablines. As there is a laundrette complete with washing machines and tumble dryers, visitors will never have to worry about dirty clothes. Anyone with small children or infants can make us of modern baby changing rooms that are available throughout the tourist season. On-site food provision facilities stock most of the most important luxury camping accessories while each individual mobile home is provided with its own power supply. A large restaurant is open during the peak and off-peak holiday seasons. This venue is proud to provide a variety of Languedoc-Roussillion dishes; ideal for those who wish to try something new. International foods as well as a menu for children are additionally available. One can choose to dine within its tranquil confines or instead to soak up the rays of the sun on an outdoor terrace. As should be expected, a nearby bar is always available to serve up a tempting cocktail, a glass of locally produced wine or a tall pint of ale. Not only is there a bakery available for all guests within this holiday camping site, but a supermarket is open throughout the tourist season. Foods, drinks, international newspapers and more can be found here. Shoppers also are able to rent barbecues for their pitches as well as clean sheets for the beds within their mobile homes.